Single Pass™ is a site that allows you to create passwords using a single "master" password. You only have to remember your Single Pass password and Single Pass will generate unique, secure passwords for every other web site you visit. You never have to write down your passwords and risk somebody stealing your passwords with Single Pass. Alternatively, write down the Service Names you use and consider using a password generator to create really complex Service Names for use with places like your bank. 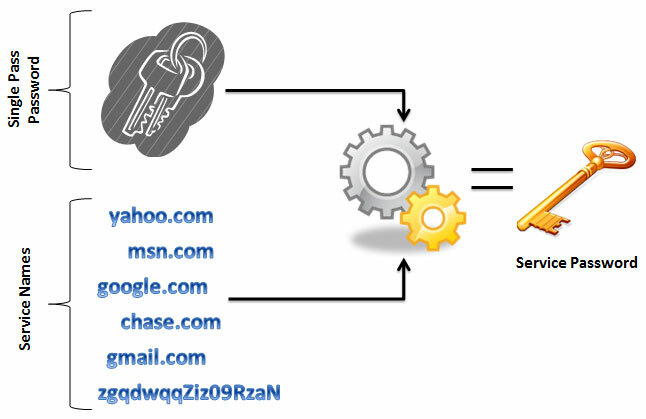 Without the exact Single Pass password and Service Name, Single Pass cannot generate the same Service Password. Complex passwords and Service Names stored in separate places (your head and a file on your computer, respectively) can help to protect your valuable information. Once you enter your Single Pass password and Service Name, click "Compute" and your web browser will compute the 16-character Service Password for your service. Use the computed Service Password when visiting a web site. Your Single Pass password is never sent to our site, so it is safe and secure in your hands. Want to learn the technical details? NOTE: The browser extension has been tested and works with Edge. You can install it from the the source via the link. However, we have not published it to the Microsoft Store since Microsoft charges US$99 for the privilege. Given the relatively low demand for Edge, it is not worth it to us to pay that fee. If it is important to you, please feel free to make that US$99 donation and we'll submit it to Microsoft for review.